At the moment the only thing valor points can be spent on – apart from buying timeless coins – is to upgrade existing gear. We can upgrade gear twice, each time adding 4 ilvls to the item, for 250VP per upgrade. Thus for 500VP we can add 8 ilvls to gear. This has meant that raiders tend to keep a stack of valor around so that when they get new gear they can immediately upgrade it by 8 ilvls to improve it. For my main I view it in the same light as enchants and gems – it’s required. In 5.4.8 – which is currently on the PTR – we’ll be able to upgrade gear four times. This means 16 ilvls for 1000VP. We’ll also be able to buy 100VP for 3000 timeless coins – although that’ll still respect the 1000VP per week maximum. The start of the bar is the starting ilvl and the end of it is with 2/2 upgrades. Thus base LFR gear is 528 ilvl and is 536 ilvl once it has been upgraded to 2/2. 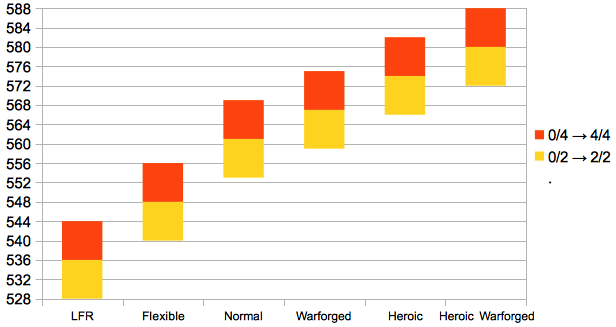 It is interesting to note that gear from neither LFR or Flex overlap with each other or normal SoO gear. 2/2 LFR gear is 4 ilvls below the base Flex 540 and 2/2 Flex gear is 5 ilvls below the base normal 553. 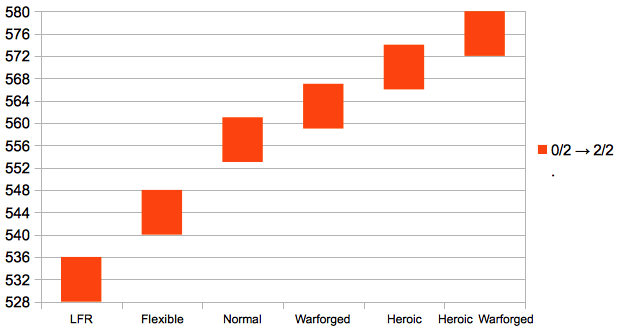 If we only consider normal or heroic gear then there is a 5 ilvl gap between the 2/2 upgraded normal gear and the base heroic gear. Warforged gear – which adds 6 ilvls to the item – changes things so that 2/2 normal warforged gear is 1 ilvl above the base heroic 566. However warforged gear is rare to see – unless you’ve been lucky with Ordos! Allowing players to add another 8 ilvls to their gear changes this. Question is, why have Blizzard done this? @WatcherDev‘s comments above are interesting; previously we’ve had zonewide buffs which slowly stack over time, starting in Icecrown Citadel and going into Dragonsoul. This will be the first end raid of an expansion which has not used that method since Sunwell Plateau in The Burning Crusade. @Consecra It's about an 8% "nerf" that will take effect gradually over weeks. It's nothing compared to 30% ICC/DS. Personally I like this change as it puts control of it into the hands of the players. It also changes the ilvl distribution a bit. Fully upgraded LFR gear at ilvl 544 will be better than the base flex 540. Fully upgraded flex gear will be better than base normal 553. Fully upgraded normal gear at ilvl 569 will be better than the base heroic gear of 566. What does this mean? Well, if you’re running LFR you can upgrade your gear to the point where running flex will be easier as your gear will be slightly better than the 540 which drops & the instance is tuned for. The same goes for switching from flex to normal. For people chasing heroic kills it is very nice as any normal gear they have can be upgraded to 2 ilvls above base heroic gear and any heroic gear they have can be upgraded to ilvl 580. From talking with others in my guild a lot of people are talking about having 3k valor going into 5.4.8 and sufficent Timeless coins to immediately cap for the week – that’s 30,000 timeless coins – so we can spend 4k VP on upgrading. Since we consider 2/2 on gear to be the norm that means we’ll get to upgrade 8 items of gear to 4/4 on the Wednesday – which also happens to be our raid night. It will be interesting to see how much of a difference that makes! This entry was posted in Mists of Pandaria, Raiding and tagged Seige of Orgrimmar, World of Warcraft. Bookmark the permalink.